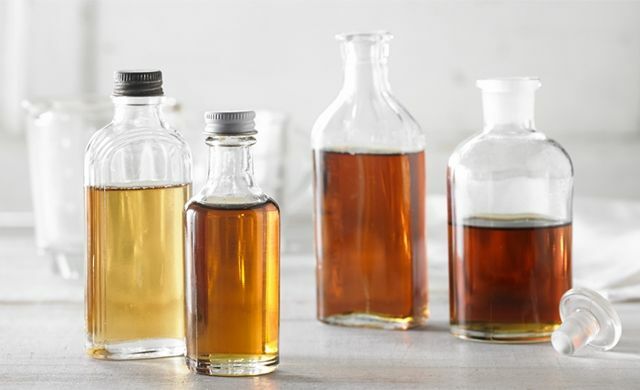 Our maple syrup varies in colour and flavour in a completely natural way, directly related to the time at which it is harvested in the sugaring-off season. Early on, the syrup is usually clear with a slightly sweet taste (Golden, Delicate Taste and Amber, Rich Taste). As the season progresses, the syrup becomes darker and more caramelized (Dark, Robust Taste and Very Dark, Strong Taste). This syrup comes from maple sap harvested at the very beginning of the sugaring-off season. It’s distinguished by its light golden hue and sweet, delicate flavour. It’s a delicious topping for yogourt and ice cream. This syrup has a pure, rich taste and a magnificent amber colouring. It’s ideal as an ingredient in vinaigrettes and all sorts of dishes and desserts. This syrup, with its more pronounced, caramelized flavour, is well-suited for cooking, baking, and sauces. It’s celebrated for the way it enhances the taste of fruity dishes. This syrup is the product of maple sap harvested at the end of the sugaring-off season. Its flavour, more pronounced than any of the previously-listed syrups, is rich and distinctive. It colours and perfumes sauces and glazes to perfection.